When one thinks of home appliances, there are a few common names that instantly come to the mind. One such name would be that of Whirlpool. The American multinational giant is the largest producer and seller of home appliances in the entire world. With 8 production facilities in the Unites States alone, it has more than 70 research and technology and manufacturing houses across the globe. It has over 100,000 people employed which help in generating a revenue of 20 billion USD annually. Whirlpool Corp. is the parent company to other brands such as Jenn-Air, Amana, Maytag, KitchenAid, Inglisa and Indesit. 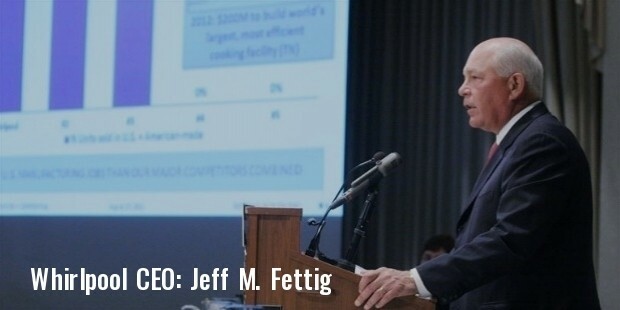 Jeff M. Fettig serves the corporation as its Chairman and CEO and is traded as WHR on New York Stock Exchange (NYSE). Whirlpool was established back in 1911 when the uncle-nephew duo Emory and Louis Upton started the Upton Machine Company. Louis used to work as an insurance salesman, while his uncle Emory ran a machine shop of his own. 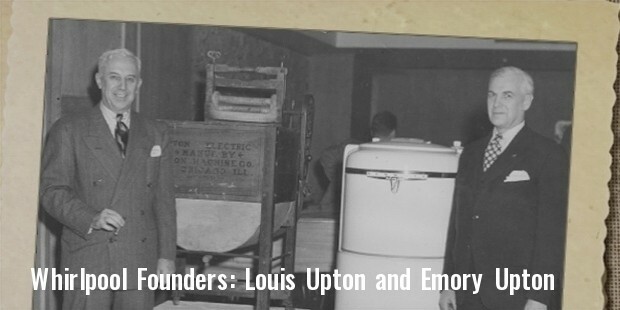 After facing failure with the business, Louis secured the patent to a manual clothes washer and asked Emory to add a motor to the design so that it could function without human assistance. When this plan was met with success, Lowell Bassford, who was a retailing executive invested in 5000 USD and they began producing electric motor powered washing machines. Soon the company started having clients such as Federal Electric and Sears, Roebuck & Co. The most crucial mergers and acquisitions to have taken place in the company’s history began within a decade of Whirlpool’s establishment. In the year 1929, the company merged with Nineteen Hundred Washer Company and adopted the name Nineteen Hundred Corporation. Soon, it acquired Seeger Refrigerator Company and RCA. Other companies acquired and merged with in the same fashion were International Harvester Company, Philips N.V., KitchenAid, Kelvinator, Embraco, Maytag Corporation and a few more. In the year 2007, it sold Hoover to Techtronic Industries and Jade Appliances to Middleby Corporation. Apart from being one of the most successful companies in the world, Whirlpool is also known for giving back to the society. The company is also known for supporting the LGBT community and received a 100% rating on the Corporate Equality Index (CEX). Whirlpool was the only major appliance manufacturing company in the world at the time to have achieved that. The charitable organizations which the company supports include Habitat for Humanity. It is a non-profit organization which helps in building low-cost housing for people who cannot afford one for themselves. Whirlpool has donated millions of dollars to their cause and also given away many appliances for the Habitat homes. Whirlpool is one of the few corporations which have managed to maintain its image and has been recognized for it by getting honored with countless awards and accolades.